At our office, we had a pretty strong hunch that we would have some follow-up to our original thoughts on “Shapchat as an Investigative Tool”. We wanted some shapchat investigative options. Recently, a few major additions to the app have been rolled out and while people are getting acclimated with how to use the new features, we have been hard at work finding ways to use this platform as an investigative tool. And unlike the conclusion of our prior publication (indicating that Shapchat was not a viable investigative platform), the future looks somewhat more promising to those in our industry who seek to keep up with the latest social media platforms. Articles outlining the new features have been published just about everywhere, and warnings about privacy and protecting America’s Shapchat using youth are littered about the web. For a more technical breakdown of how to access these features and how to protect yourself, we recommend the following piece on Techcrunch.com. Getting some of the technical aspects out of the way, we find the new features ripe for exploration. The most major new feature to Shapchat is the recently added “Snap Map” which allows users to see their friends on a map and look at public snaps of others who are not their friends, anywhere in the world. Most people have figured out how to remain in “ghost mode” which will hide their location from their friends. That’s just fine by us, as we will not be connecting with, following or befriending those people we are investigating anyways. Let’s however presume for a moment that you have friends on Shapchat and they are not using ghost mode. Their location will show as of the last time they opened the app. Their location is fairly accurate too, especially if that person is on a local Wi-Fi. Again, in our industry, we are not befriending anyone we are investigating, so as useful as this feature may seem, it would be in the same realm as friend requesting the target of an investigation on Facebook; not recommended for compliant investigations and therefore not a useful investigative tool. The Snap Map itself also includes public snaps taken by users that are designated to the specific geographic location that the snap was taken. These Snaps are visualized as “heat signatures” on the map and in instances of multiple Snaps being posted from the same location by many users, the visualization is dark red, indicating many snaps at that location. These clips result in a display that is an end to end combination of Snaps by all of those users. The downside of all of this is that if you are viewing an individual Snap or a strand of Snaps at a location, there is no way (yet) to determine which user posted said Snap. We are still okay from an investigative standpoint since most of the locations (residences and workplaces) will not normally include multiple Snaps by multiple users. Those very active locations tend to be events or large gatherings where many attendees are posting public Snaps. The example of a user simply taking a Shapchat video at their home will be a light blue visualization. These Snaps are normally available on the map for twenty-four hours. This is the heart of where we think there is some investigative benefit. We have to make some reasonable assumptions here. In short, this means that the techniques won’t work on every case, even if the target of the investigation is a rampant Shapchat user. The first assumption is that we have an app to record video from Shapchat. As previously discussed, there are now many apps that will allow a user to do so on both mobile devices and desktop apps, using Android Emulators on a Windows or Linux PC. The second assumption is that the target of the investigation regularly creates public Snaps from their home or workplace (addresses that an investigator knows they live or work at). The downside to searching for Snaps geographically at a target’s home is that the Shapchat “search feature” only allows a user to look for a specific city or event. This means going to a second device (or screen) to look for cross streets and manually moving the Snap Map to the exact location you are looking for. This can be done fairly precisely as you will see below. 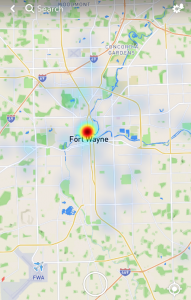 If you type in “Fort Wayne, IN” you get the following map view. 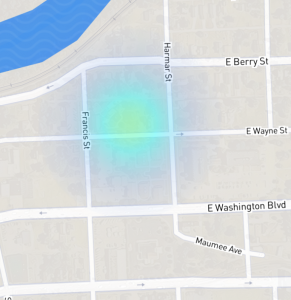 If you know that your target lives near the major intersection of E Washington and Harmar Street in Fort Wayne, you can identify this location to see if any recent Snaps have been posted from that area. While you may end up with a Snap of some scenery or a dog running in a yard and still not know who posted the Snap in the first place, you can be fairly accurate in identifying where the Snap was taken. The final presumption and probably the most important one, is that the Snap depicts your target or people you know them to live with. Snaps of people that can be recorded and replayed may contain imagery of your target or useful information to your investigation. As of now, we feel that this is the most useful tool to an investigation. The obvious need is to search the location regularly to see if anything new has been Snapped while looking for anything of interest to you case. While not the most robust platform for investigations, it is sometimes those small elements that you can pick up on in a photo or video that can make or break a case, which is why we feel that these new Shapchat features can prove viable on some cases and are certainly worth the time of a diligent investigator determined to turn over every stone for their clients. ASG Investigations is a professional investigative agency headquartered in metro-Detroit, specializing in background checks, skip tracing, Snapchat Investigations, and complex investigations both domestically and internationally.